At McGraw-Hill Education, we believe student success in math is the key to a successful college career and greater real-world opportunities. View our collection of case studies highlighting how course redesigns with ALEKS have helped students achieve math success. Ready to try ALEKS? CLICK HERE to request an ALEKS pilot, or contact us to learn more. 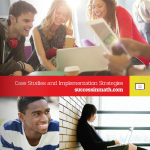 View additional case studies and research papers, as well as a selection of student success stories.